With the acquisition, should it pass French regulatory muster, the company would add a team of 100 specialists trained in Google Cloud and G Suite to the an existing team of 2600 Google specialists worldwide. The company sees this as a way to enhance its artificial intelligence and machine learning expertise in general, while giving it a much strong market placement in France in particular and the EU in general. As the company stated there are some hurdles before the deal becomes official. “The acquisition requires prior consultation with the relevant works councils and would be subject to customary closing conditions,” Accenture indicated in a statement. Should all that come to pass, then Cirruseo will become part of Accenture. 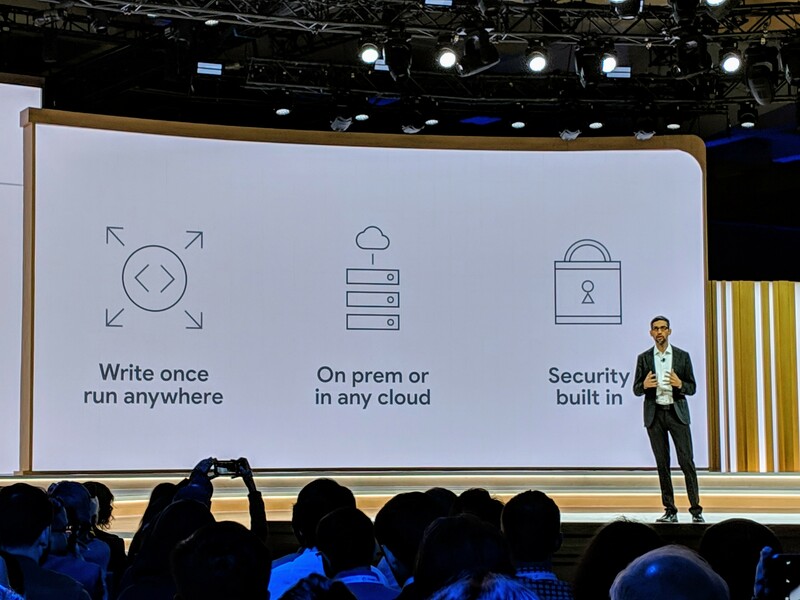 At Google Cloud Next today, the company announced it is bringing two brand new data centers online in the 2020 timeframe with one in Seoul, South Korea and one in Salt Lake City, Utah. The company, like many of its web scale peers, has had the data center building pedal to the medal over the last several years. It has grown to 15 regions with each region hosting multiple zones for a total of 45 zones. In all, the company has a presence in 13 countrie and says it has invested an impressive $47 billion (with a B) of CAPEX investment from 2016-2018. “We’re going to be announcing the availability in early 2020 of Seoul, South Korea. So we are announcing a region there with three zones for customers to build their applications. Again, customers, either multinationals that are looking to serve their customers in that market or local customers that are looking to go global. This really helps address their needs and allows them to serve the customers in the way that they want to,” Dominic Preuss, director of product management said. In addition, the company announced that its new data center in Osaka, Japan is expected to come online some time in the coming weeks. One in Jakarta, Indonesia, currently under construction is expected to come online the first half of next year. Two of the biggest trends in applications development in recent years have been the rise of serverless and containerization. Today at Google Cloud Next, the company announced a new product called Cloud Run that is designed to bring the two together. At the same time, the company also announced Cloud Run for GKE, which is specifically designed to run on the Google’s version of Kubernetes. Oren Teich, director of product management for serverless, says these products came out of discussions with customers. As he points out, developers like the flexibility and agility they get using serverless architecture, but have been looking for more than just compute resources. They want to get access to the full stack, and to that end the company is announcing Cloud Run. “Cloud Run is introducing a brand new product that takes Docker containers and instantly gives you a URL. This is completely unique in the industry. We’re taking care of everything from the top end of SSL provisioning and routing, all the way down to actually running the container for you. You pay only by the hundred milliseconds of what you need to use, and its end-to-end managed,” Teich explained. As for the GKE tool, it provides the same kinds of benefits, except for developers running their containers on Google’s GKE version of Kubernetes. Keep in mind, developers could be using any version of Kubernetes their organizations happen to have chosen, so it’s not a given that they will be using Google’s flavor of Kubernetes. “What this means is that a developer can take the exact same experience, the exact same code they’ve written — and they have G Cloud command line, the same UI and our console and they can just with one-click target the destination they want,” he said. All of this is made possible through yet another open source project the company introduced last year called Knative. “Cloud Run is based on Knative, an open API and runtime environment that lets you run your serverless workloads anywhere you choose —fully managed on Google Cloud Platform, on your GKE cluster or on your own self-managed Kubernetes cluster,” Teich and Eyal Manor, VP of engineering wrote in a blog post introducing Cloud Run. Serverless, as you probably know by now, is a bit of a misnomer. It’s not really taking away servers, but it is eliminating the need for developers to worry about them. Instead of loading their application on a particular virtual machine, the cloud provider, in this case, Google, provisions the exact level of resources required to run an operation. Once that’s done, these resources go away, so you only pay for what you use at any given moment. Specifically, Slack is integrating calendar, files and calls and bringing in integrations with other services including Box, Dropbox and Zoom. Andy Pflaum, director of project management at Slack, came over in the Astro deal and he says one of the primary goals of the acquisition was to help build connections like this to Microsoft and Google productivity tools. “When we joined Slack, it was to build out the interoperability between Slack and Microsoft’s products, particularly Office and Office 365 products, and the comparable products from from Google, G Suite. We focused on deep integration with mail and calendar in Slack, as well as bringing in files and calls in from Microsoft, Google and other leading providers like Zoom, Box and Dropbox,” Pflaum, who was co-founder and CEO at Astro, told TechCrunch. For starters, the company is announcing deep integration with Outlook that enables users to get and respond to invitations in Slack. You can also join a meeting with a click directly from Slack, whether that’s Zoom, WebEx or Skype for Business. What’s more, when you’re in a meeting your status will update automatically in Slack, saving users from manually doing this (or more likely forgetting to and getting a flurry of Slack questions in the middle of a meeting). Another integration lets you share emails directly into Slack. Instead of copying and pasting or forwarding the email to a large group, you can click a Slack button in the Outlook interface share it as a direct message, with a group or to your personal Slack channel. “The collaboration market is highly fragmented with many vendors adding “just a little” collaboration to products designed for specific purposes. Buyers can find that this type of collaboration in context to the flow of work is more impactful than switching to a generalized tool that lacks situational awareness of the task at hand. Knowledge-based work often involves process and project related applications so the more we can handle transitions across tools the more productive the user experience becomes. More importantly there’s less context fragmentation for the individual and team,” Gotta told TechCrunch. There’s been a huge boom in the last decade of applications and services that rely on on real-time notifications and other alerts as a core part of how they operate, and today one of the companies that powers those notifications is announcing a growth round. PubNub, an infrastructure-as-a-service provider that provides a real-time network to send and manage messaging traffic between companies, companies and apps, and betweeninternet-of-things devices — has raised $23 million in a Series D round of funding to ramp up its business internationally, with an emphasis on emerging markets. PubNub’s growth — along with that of competing companies and technologies, which includes the likes of Pusher, RabbitMQ, Google’s Firebase and others — has come alongside the emergence of a number of use cases built on the premise of real-time notifications. These include a multitude of apps, for example, for on-demand commerce (eg, ride hailing and online food ordering), medical services, entertainment services, IoT systems and more. Along with Amazon Web Services and Microsoft Azure, Google is building the infrastructure of the web. Countless startups use Google Cloud as their only hosting provider. And there are now launching more and more specialized and niche services. So it’s going to be interesting to see what Google has in store to beat their competitors on the cloud front.